Milledgeville, a small southern town in central Georgia, is known for its antebellum heritage and as the former capital of the state (1807-1868). 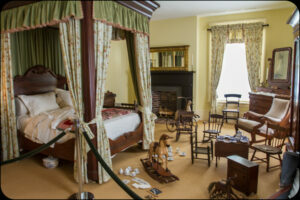 The Old Governor’s Mansion housed ten first families between 1839-1868, before the government relocated to Atlanta. The mansion is touted as one of the finest examples of High Greek Revival architecture in the nation, designed by Irish architect Charles B. Cluskey. The pre-Civil War price to construct the gem was just $50,000. Today, it looms over the campus of Georgia College, a solid brick structure covered in stucco which is now painted a creamsicle color, supposedly matching the original hue. 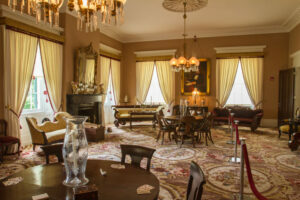 The most notable event in the mansion’s history was likely its take-over by General William T. Sherman’s during his infamous “March to the Sea.” He headquartered in the building on November 22, 1864 and his Union soldiers camped in the yard. 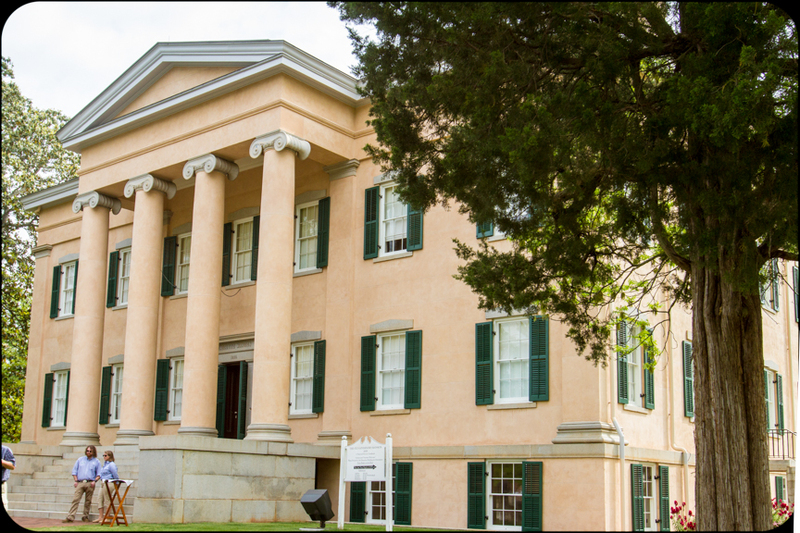 While Sherman’s invasion destroyed several Milledgeville homes, the central depot, and the bridge across the Oconee River and the state arsenal, he went soft on the grand three story columned residence and saved it. The Governor at the time, Joseph E. Brown, had previously evacuated to Macon and left no soldiers to defend the capital city. Sherman finalized his planes for the capture of Savannah while in Milledgeville. Governor Brown and other officials returned to the ransacked city after the Union army departed, but the war soon ended and swept them from power. Reconstruction era politicians voted to relocate the capital to Atlanta in 1868. I toured the mansion starting on the ground floor in the rear. The guide explained that the basement walls are 34 inches thick. 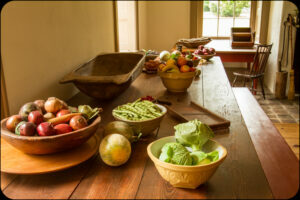 The kitchen dominates the bottom floor along with 1,500 square foot State Dining room that was used for entertaining. A matching ballroom rests on the floor above. 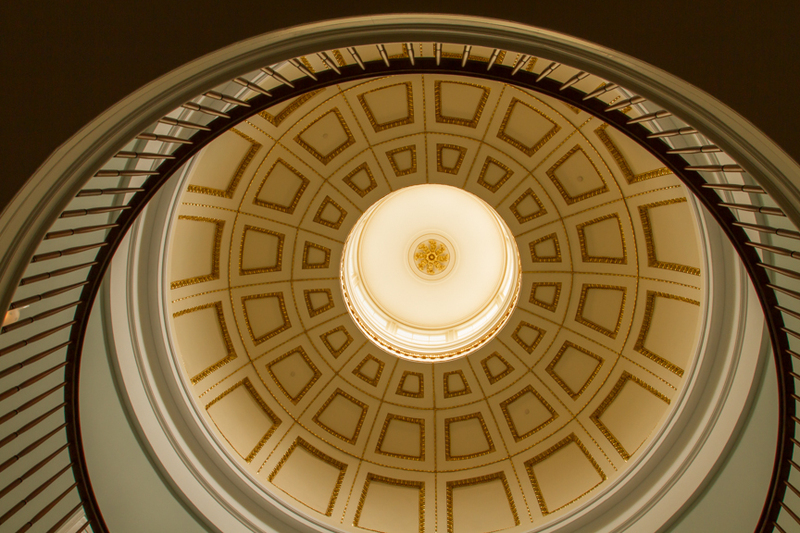 The most surprising discovery of the 21,900 square foot structure was finding the massive interior rotunda and balcony; the beautiful gold-leaf dome is totally hidden on the exterior. You enter and are stunned…which I suspect was the intention. 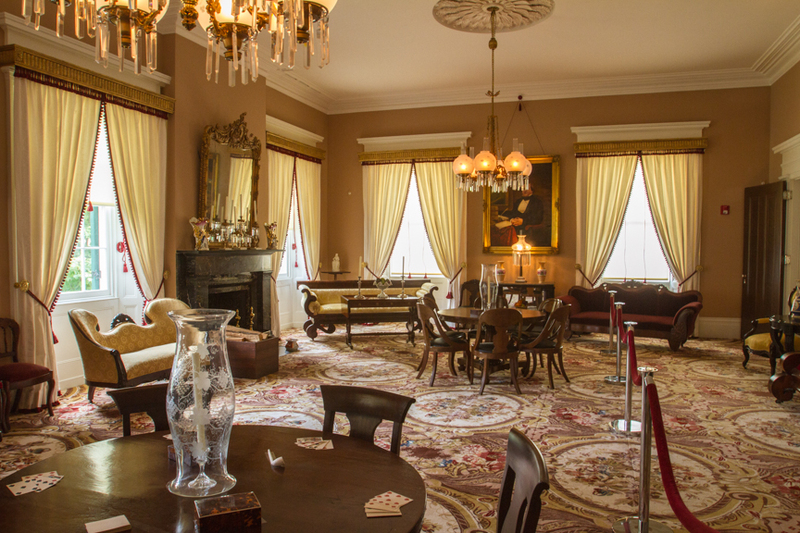 The main floor contains the salon, which is over sixty feet long and patterned after the East Room of the White House, a private dining room, family living room and office space. Chandeliers used to be fueled with sperm oil. The third floor includes numerous bedrooms and additional offices. 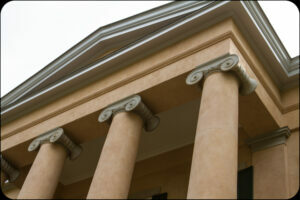 Mansion ownership changed many times over the decades. In 1889 it was given to Georgia Normal & Industrial College (currently known as Georgia College), and for years was used as a dormitory. Pretty amazing that 95% of the glass is original. In the 1960s, the university used it as the president’s office and as a hostelry for overnight VIP guests. Beginning in the late 1990s, an initiative was begun to return the Mansion to its antebellum splendor. 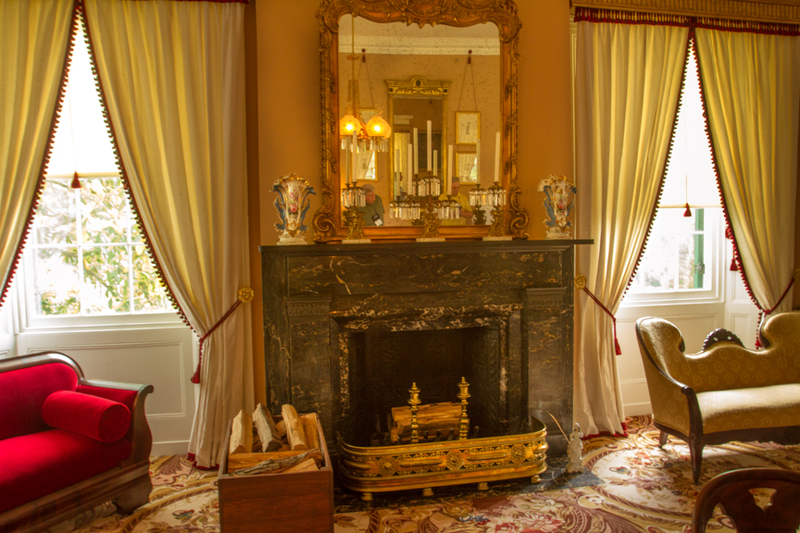 Following five years of intensive historical, structural, and material research, the Old Governor’s Mansion began its long awaited restoration. Over three years of work and at a cost of $9.5 million, the site was restored to the original layout, colorations, lighting, and appearance of the building. The Old Governor’s Mansion with its stately columns and imposing facade now serve as an historic house museum whose mission is to care for, collect, interpret, and exhibit items that illustrate the history of the site and its inhabitants. If you find yourself in the Lakes Country of Georgia, a stop in Milledgeville is a must. Many thanks to the Georgia Dept. of Economic Development for the visit.